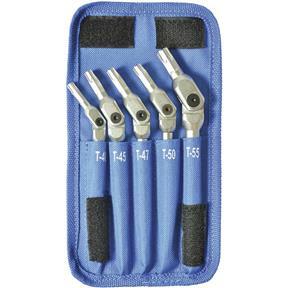 T40-T55 Hex Pro Star (Torx) Set, 5 pc. 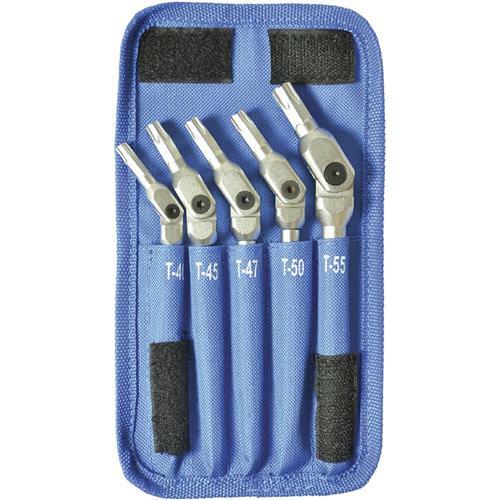 Bondhus 00018 - T40-T55 Hex Pro Star (Torx) Set, 5 pc. These HexPro pivot head star wrenches are made of heat treated high quality industrial tool steel and matte chrome finish to prevent corrosion. Fits Star and TORX brand screws and features long handles for extra reach. Heavy duty folding canvas pouch/holder included. Set includes T40, T45, T47, T50, and T55 sizes. Perfect tools for what I needed. Compact and strong, with the ability to get into tight places and change the grip angle to suit my needs.